After Jeff Sessions' Ouster, Acting AG Matthew Whitaker To Oversee Mueller Probe The chief of staff to former Attorney General Jeff Sessions, Whitaker is a former U.S. attorney with a history of questioning the scope of special counsel Robert Mueller's Russia investigation. 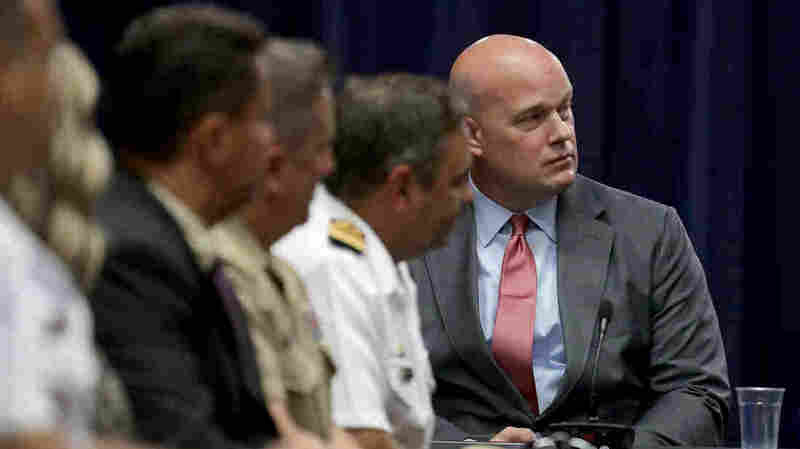 New acting Attorney General Matt Whitaker participates in an August roundtable event at the Department of Justice's Kennedy building in Washington, D.C.
"It is a true honor that the President has confidence in my ability to lead the Department of Justice as Acting Attorney General," Whitaker said in a statement Wednesday evening. "I am committed to leading a fair Department with the highest ethical standards, that upholds the rule of law, and seeks justice for all Americans." Of Sessions, Whitaker added he "has been a dedicated public servant for over 40 years. It has been a privilege to work under his leadership. He is a man of integrity who has served this nation well." Whitaker was Sessions' chief of staff and so he'll step into the job with a nearly complete working knowledge of the department — except for Mueller's investigation. That's because Sessions had recused himself, calling it inappropriate that he lead an inquiry into Trump's 2016 presidential campaign of which he was a part. Mueller is looking into whether anyone on that campaign might have conspired with the Russians who attacked the 2016 election. "Mueller has come up to a red line in the Russia 2016 election-meddling investigation that he is dangerously close to crossing," Whitaker wrote in an op-ed last year before he came to work for the government. Trump has made clear that he believes he has the power to fire Mueller altogether, through the leadership of the Justice Department or outside it. The president's lawyers have argued he has vast privilege under the Constitution to hire or dismiss nearly anyone within the executive branch. Mueller's inquiry is a "hoax," the president said, and asked why, if it's supposed to find "collusion" between his campaign and the Russians, it hasn't found any. "I could fire everybody right now," Trump said. "But I don't want to stop it because politically, I don't like stopping it." When the special counsel's office wants to issue a subpoena or send investigators or call witnesses before a grand jury, the deputy attorney general is often involved. If the new leadership at the Justice Department didn't want to go along, however, that could constrain Mueller's ability to investigate as he sees fit. The new acting attorney general or whoever serves as his fulltime replacement could simply brief Trump and his aides on where the special counsel is focused if the president doesn't know already. "Given his record of threats to undermine & weaken the Russia investigation, Matthew Whitaker should recuse himself from any involvement in Mueller's investigation," House Minority Leader Nancy Pelosi, D-Calif., said on Twitter. "Congress must take immediate action to protect the rule of law and integrity of the investigation"
Pelosi is set to become speaker of the House when Democrats are seated with their new majority in the incoming Congress. She and the House intelligence committee's incoming chairman, Rep. Adam Schiff, D-Calif., have said they want to help protect Mueller and launch investigations of their own into Trump. Before he became Sessions' chief of staff, Whitaker was an accomplished athlete and attorney in Iowa. In college, he started at tight end for an Iowa Hawkeyes football team that played in the 1991 Rose Bowl. He was the co-chairman of former Texas Gov. Rick Perry's 2012 Iowa campaign for president, and campaigned himself for the Senate seat opened by the retirement of Democrat Tom Harkin. Whitaker garnered more than 11,000 votes in the primary, which he lost to Joni Ernst who went on to win election to the Senate. He also worked on an earlier campaign in Iowa for one of Trump's presidential campaign leaders, Sam Clovis, who has figured in the Russia investigation. Clovis is believed to be one of the campaign officials who talked with a junior aide, George Papadopoulos, about the overtures Papadopoulos was getting from Russians in London.